My Sally Hansen love goes way, waaay back to my teens, but these past few collections have made me fall in love with the brand all over again. They've put out three awesome new collections pretty much simultaneously and they're kinda blowing my mind. The Designer Collection brought a stunning variety of creams, metallics, and a flawless jelly (I did wind up buying Perfectly Poppy). Fall's new Xtreme Wears are all glitter mixes. I've been prepping for this post for a while now and my excitement has been building and building as I got closer to being ready to publish it. 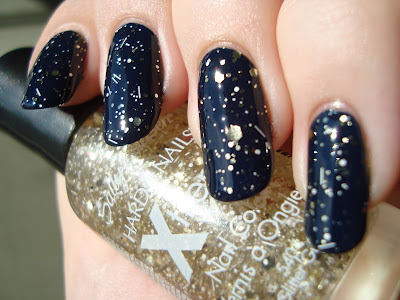 Hhhhhhhholy crap...these glitters!! I bought them at Wegmans (where they're on sale for $1.99 for another couple weeks), but I haven't seen them anywhere else but Target yet. I've heard of them showing up at all of the typical stores where you'd find the brand though. If you haven't found them yet...find them, really! I'm so impressed by them that I don't even know how to fully express it. The formulas for the bases are exactly what they should be, thick but not gloppy. The mixes are well-balanced and tasteful. They're really just perfection, all of them. The collection has ten different shades....well...more on that in a moment, but let's call it ten for now. I bought all but Green Rocket and Rosey Shooter, which just didn't strike me. I initially skipped Confetti Punch, but I saw the error of my ways after seeing it in vanillawafer138's swatch wheel post on MUA. Gotta thank her for that! So ten shades is actually kinda eleven. Glitter Gun comes in two versions. I'm a glutton, so I bought both. HUGE thanks to G. from Nouveau Cheap (and her reader Emily) for pointing out the difference. I'd have been disappointed if I'd missed either. I applied all of these glitters by a mix of stroking and dabbing with the brush, to ensure a good distribution of glitter and to keep the bar glitters (in the ones that have them) from all pointing the same way. I also swirled the brush in the bottle to get the best mix. You don't have to do either technique, but the results are better this way, especially since the largest glitters can play hard to get at times. Since I didn't apply them in typical coats, my reviews only describe the variety and density of the glitters. The only application issue I had was tiny bubbles forming in the glitter base. They're barely visible though and I think they happen because the bases are so thick and smooth. Enough talk...on to the swatches! The "small bore" version of Glitter Gun is a mix of four sizes of gold hexagonal glitter, small white hexagons, and small, thin white bar glitter in a clear base. I get the impression that the small bore version was a happy accident. It's essentially the same as the large bore, but missing most sizes of white glitter. The result, whether they meant to do it or not, is a little on the sparse side, but the result is very cool! The gold 'comes and goes' with the light. It's dazzling in the sun, but more subdued at other times, when the contrast between it and the white becomes more obvious. 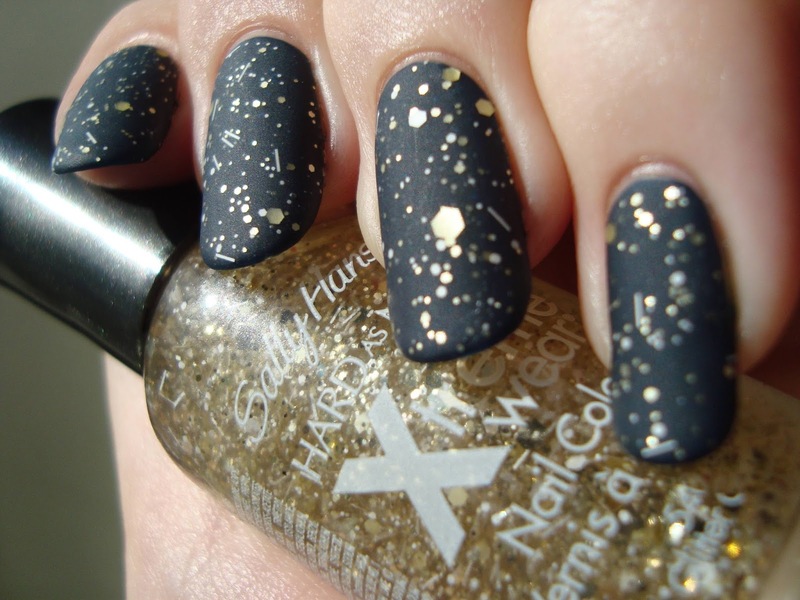 Zeus hates bar glitter, but loved this combo. He said it looks like an old fashioned star chart. I know what he means and I couldn't have come up with a better description. 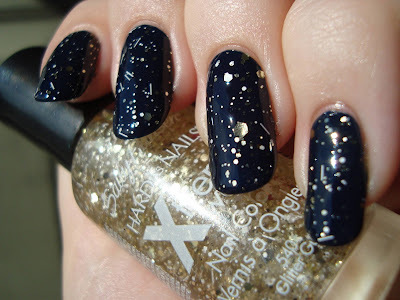 I mattified it (and all of the other swatches in this post) and it only enhances the stellar vibe. The "large bore" version of Glitter Gun has four sizes of gold hexagonal glitter, five sizes of white, and thin white bar glitter in a clear base. Where the small bore version is a bit delicate, the large bore packs way more punch. The glitter is much denser, though the huge white glitters take a little fishing. 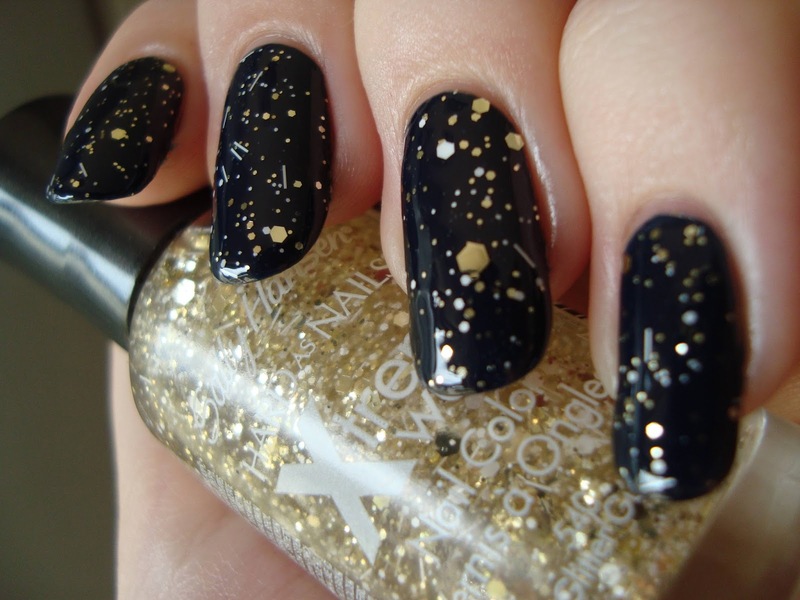 There also aren't a ton of them, so don't expect one on every nail...or even one in every manicure maybe. 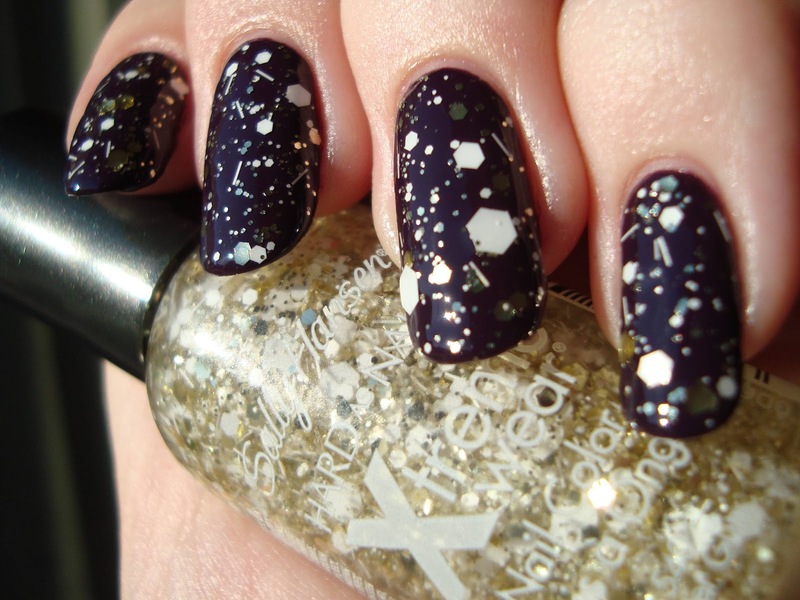 Strobe Flash has five sizes of white hexagonal glitter, five sizes of black, and thin black bar glitter in a clear base. 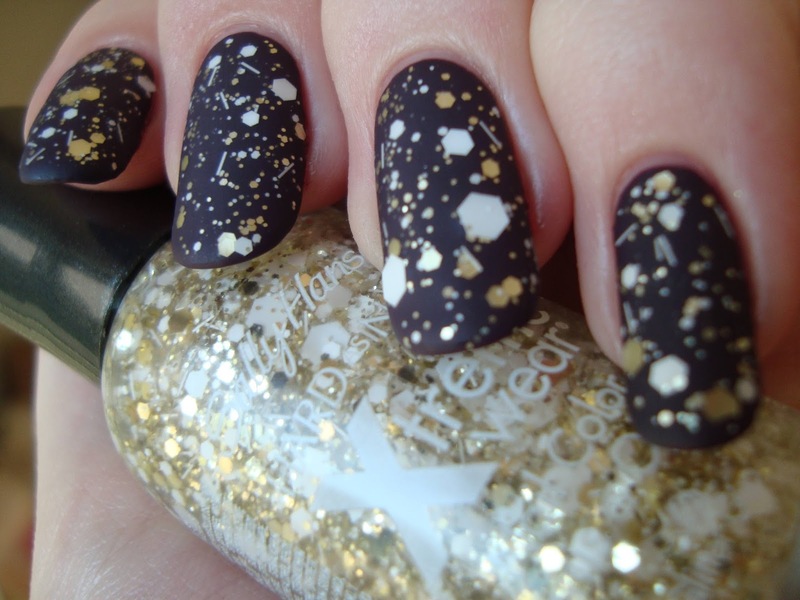 Wasn't it just a few months ago that I was bemoaning a lack of drugstore black and white glitters? Yes, yes it was. Since then they're suddenly everywhere. Maybelline put a terrific (and bar-less) one out just weeks later and it's in their core line now, like I'd hoped. Milani had two, though the glitter balance seemed off in both. I haven't done a direct comparison between Strobe Flash and Claire's Splatter Paint, but I think Strobe Flash is less dense and has more variety in the size of its glitters. You probably don't need both. 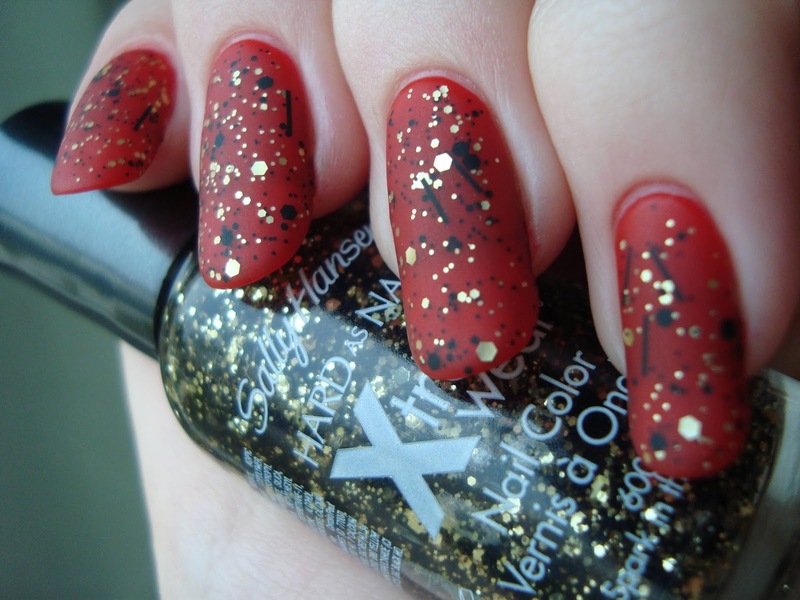 Sally Hansen's version is less expensive, but also limited edition. Silver Streamers four sizes of silver and five sizes of black hexagonal glitter, plus thin black bar glitter in a clear base. Another look that's familiar. Silver Streamers is superficially similar to China Glaze Glitz 'N Pieces, but behaves a lot better and doesn't look like sparkly chaos when it's glossy. If you liked the idea of the China Glaze, but not the reality, you should give the look a second try with Silver Streamers. 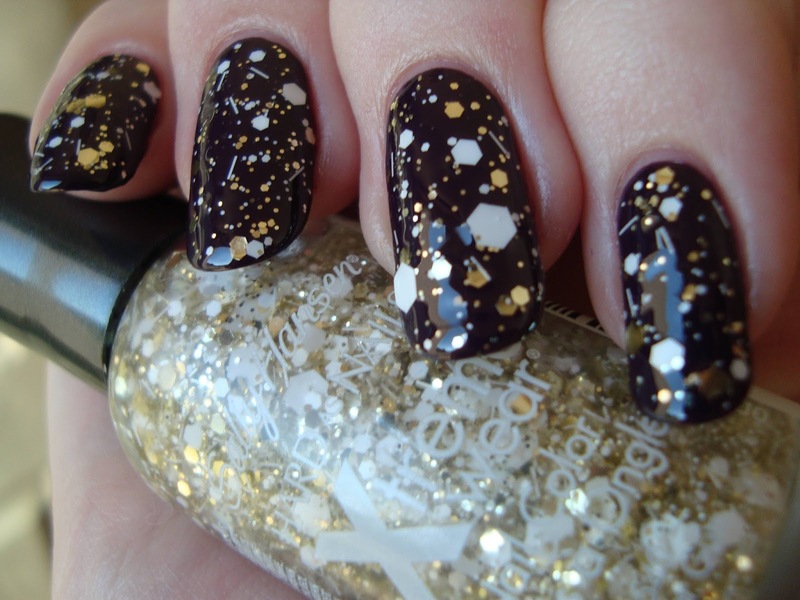 Spark In The Dark has four sizes of gold and five sizes of black hexagonal glitter, plus thin black bar glitter in a clear base. Somehow I didn't get any of the large gold or black or any of the huge black glitters on my nails this time. Oops! Spark In The Dark really does have the same variety of sizes as Silver Streamers, I swear! Still, I won't complain about the result! I love these two together and mattified....well...I really should mattify jellies more often! 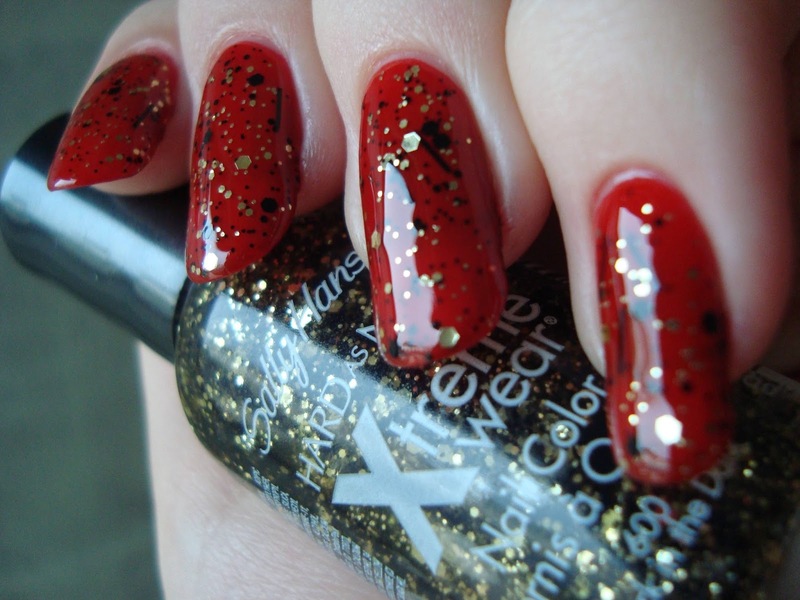 Frazzle Dazzle has thin black bar glitter and four sizes of gold and copper bar glitter in a clear base. Here I go being trendy again. I know....but in my defense, I don't do it often. I couldn't help myself. The military look was just there waiting to happen. 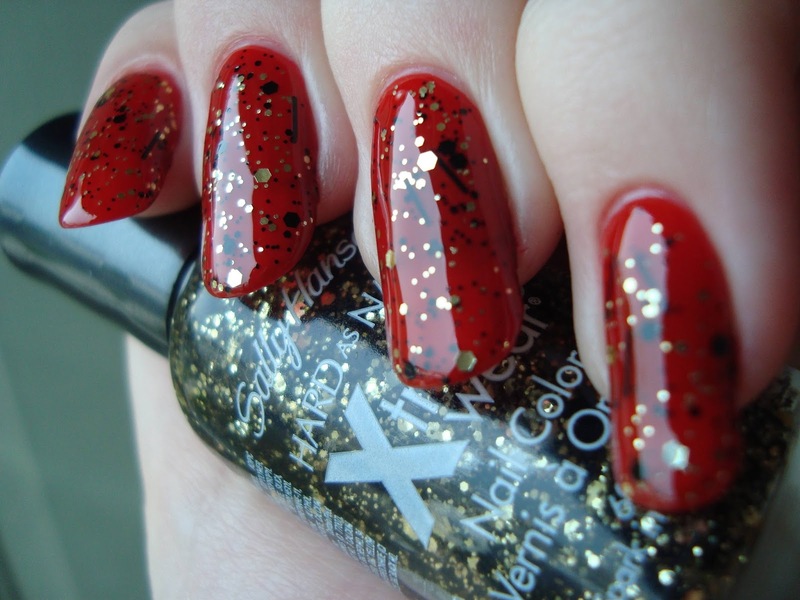 Razzle Dazzler is possibly the sparsest of any of these glitters, so this is two "coats" in a way. Not exactly, since I dabbed it on with the brush, but I had to go back and add more to keep it from looking meager. In lower light (like the first photo) you can tell the copper and gold apart easily. In direct sunlight the contrast isn't as obvious. Same goes when it's mattified. The sun makes it all just look coppery. The contrast is most obvious when it's mattified and out of direct sunlight. Seal-y String has tiny black, small blue, and large silver hexagonal glitter and black bar glitter in a blue-tinted base. The base of Seal-y String is just tinted enough to give some of the silver glitters a slight blue cast. It changed the base color just a little, but I think that worked in its favor, harmonizing the look. The blue glitters had shy moments over the blue base I chose, but I liked the effect. They were more obvious when mattified. Confetti Cake has tiny light purple, medium silver and bright blue, and large silver and black hexagonal glitter in a purple-tinted base. I love the boldness of the blue glitter in Confetti Cake! It really stands out among the other parts of the mix. The tinted base darkened the color under it slightly, but should flatter a pretty large range of colors. 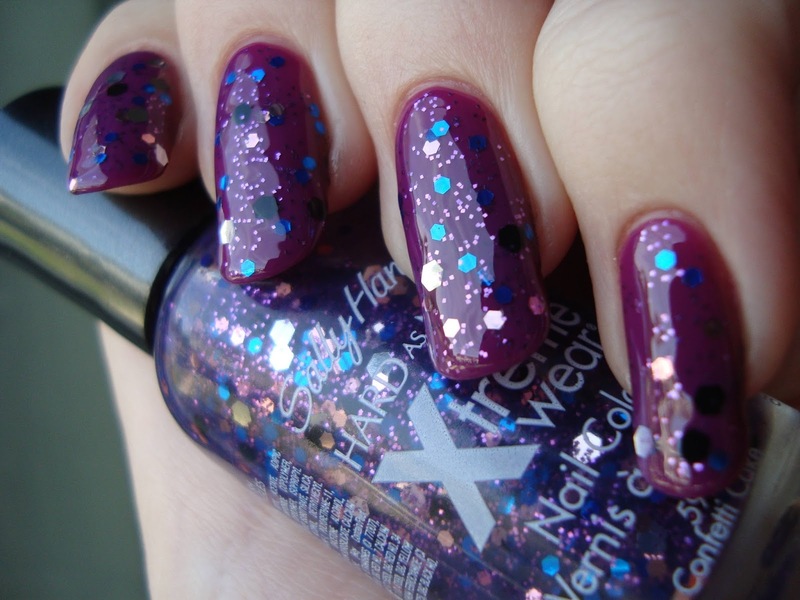 The little lilac glitter shows better at some angles than at others, but when it shows, it glows. Confetti Punch mixes tiny fuchsia, small gold and green, and medium blue hexagonal glitter in a fuchsia-tinted base. The combo I chose for Confetti Punch looks like what would happen if Private I got dressed up for a birthday party. I wanted to tone down the pinkness and make it feel a little more autumnal. I'm pleased with how that attempt turned out and I think Confetti Punch has a lot of potential even for pink haters like me. I can't resist the fuchsia twinkle and I love the quirky variety of colors and sizes. The mattified look reminds me even more of Private eye topped with confetti. Bottom line: I honestly don't think I could like these any more than I already do. They're perfect. They're easy to apply, though I did swirl the brush, fish out the shapes I wanted, and dab with the brush at times to get exactly the look I wanted. They still don't need anywhere near as much fuss as many other glitters I've worn. The mixes are all visually interesting, even though a few have near-dupes from other brands. I've seen people write the collection off as being too similar to China Glaze Glitz: Bitz 'N Pieces, but they're really not. Both collections have a silver and black mix, but where the China Glaze is chaotic and gloppy, these are all well-balanced and smooth. I can't say all nine of these are must-haves, but I also like them all enough to not really be able to pick favorites. They're all damn good. So I'm teasing a future post again...two really. 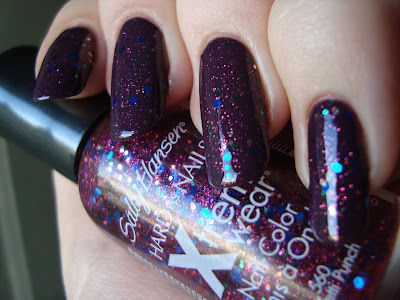 This is a good season for polish overall, but it's turning out to be an amazing season for creams...and foils...and glitters....and a bad season for my budget! Wow! Thanks for posting... I've been stalking the stores for almost 3 weeks now for these, and I needed inspiration to stay strong and keep looking! You can do it! They're worth hunting for. Yep, I'm gonna have to buy all of them. hehe Don't forget there are a white and green and a white and red mix that I skipped. Just found your blog and have been obsessed. Love your pictures!